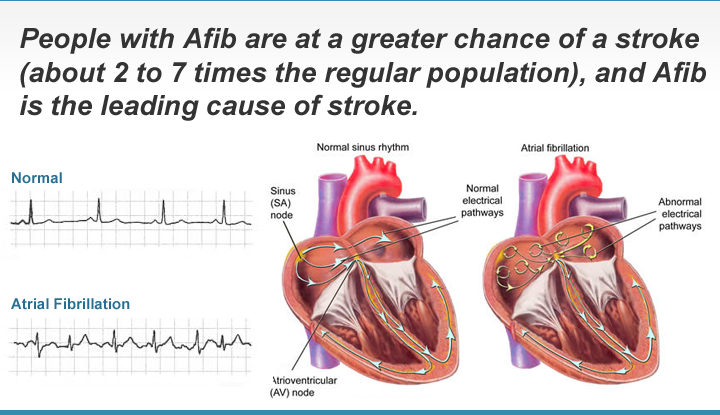 Atrial fibrillation (Afib) is a cardiac dysrhythmia (an irregularity of the heart’s rhythm) in which there is chaotic electrical activity in the upper chambers (at 350-600 beats per minute) causing them to quiver instead of contracting in an organized way. The electrical impulses travel to the ventricles resulting in an irregular and usually rapid heart rate or pulse. Afib is classified into 4 categories based upon frequency and duration of episodes: Initial event, paroxysmal, persistent, and permanent. On an ECG (electrocardiogram) Afib is recognized by the absence of distinct P waves and the presence of small irregular oscillations or ‘fibrillatory’ waves and the ventricular response (QRS) is irregular. Approximately 2.4 million adults in the United States currently have Afib and this is expected to increase to over 5 million by 2040. (Go, et al. JAMA 2001;285:2370-2375). Afib is seen in every adult age group but the prevalence increases with age such that approximately 10% of patients older than 80 years old have this disorder. More Info: Learn how we screen for Atrial Fibrillation Heart Rhythm.